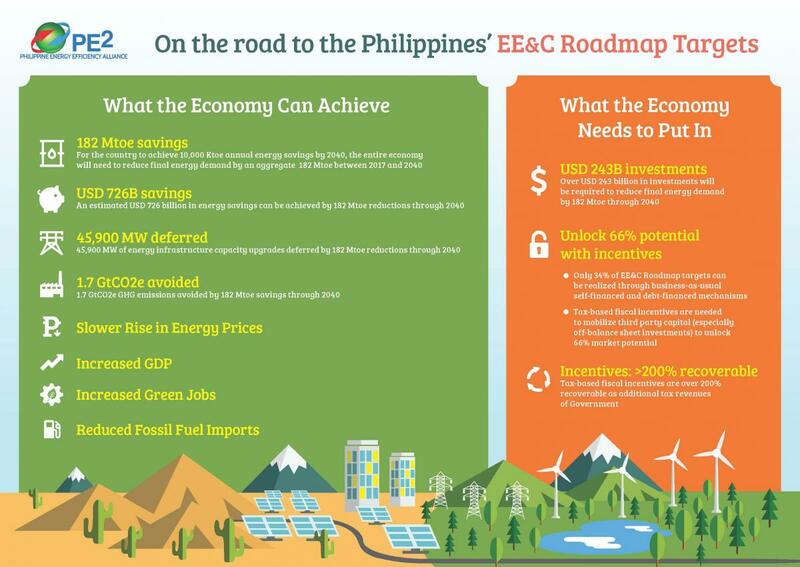 The delay in the passage of the Energy Efficiency and Conservation Act (EE&C) is depriving the economy of the immediate benefits of the P37.8 trillion estimated savings from curbing energy use through 2040, the Philippine Energy Efficiency Alliance (PE2) said. PE2, a non-stock, non-profit organization of energy efficiency market stakeholders, said in a statement on Thursday that the proposed law could also soften the impact of rising energy prices. TAGUIG CITY, 14 February 2019 – The Philippine Energy Efficiency Alliance (PE2) met earlier today Atty. Cesar G. Dela Fuente III, the newly appointed OIC Director of the Energy Utilization Management Bureau (EUMB) of the Department of Energy (DOE). Director Dela Fuente replaced Director Jesus T. Tamang, who was transferred to the Energy Resource Development Bureau late last week. Atty. 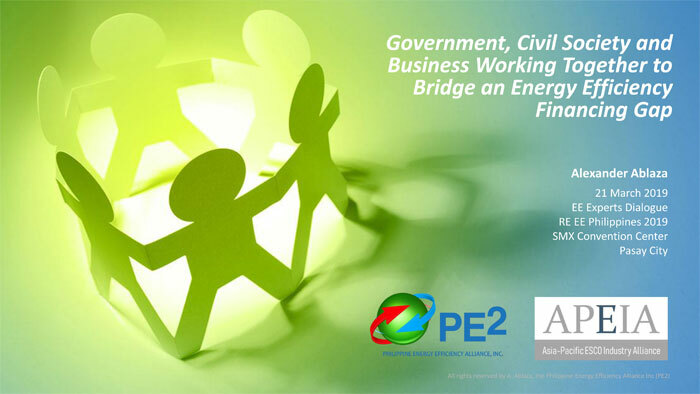 PASAY CITY, 31 January 2019 – The Philippine Energy Efficiency Alliance (PE2) joined earlier today the Renewable Energy Association of the Philippines (REAP), the Philippine Water Works Association (PWWA), the Philippine Society of Sanitary Engineers (PSSE), the Philippine Integrated Society of Master Plumbing (PISMAP) and UBM Exhibitions Philippines in a collaborative show of support and public announcement of the joint holding of RE EE Philippines 2019 and Water Philippines 2019 on 20-22 March 2019 in the SMX Convention Center. PASAY CITY, 31 January 2019 – The Philippine Energy Efficiency Alliance (PE2) performed today an ocular inspection of the power substations of Terminal 2 (T2) of the Ninoy Aquino International Airport (NAIA). This was conducted as a preparatory milestone to help PE2 formalize an offer to donate to the Philippine Government, through the Department of Energy (DOE) and the Manila International Airport Authority (MIAA), a pilot energy monitoring system project under the DOE-led Government Energy Management Program (GEMP). THE ENERGY SECTOR will play a big role in implementing the proposed energy efficiency and conservation law as about half of the thousands of megawatts that can be displaced with the adoption of the legislation will come from power facilities, an official of an industry organization said. Alexander Ablaza, president of the Philippine Energy Efficiency Alliance, Inc. (PE2), said 45,900 megawatts (MW) are waiting to gathered through energy efficiency initiatives, of which about 23,000 MW are currently accounted for by power facilities. TAGUIG CITY, 28 January 2019 – The Philippine Energy Efficiency Alliance (PE2) met with the European Union (EU)-funded Access to Sustainable Energy Programme (ASEP) Technical Assistance project team and a representative of the Department of Energy (DOE) Energy Utilization Management Bureau (EUMB) earlier today to continue exchanges on the needs of the energy efficiency sector and possible collaborative opportunities through the anticipated extension of the ASEP program term.